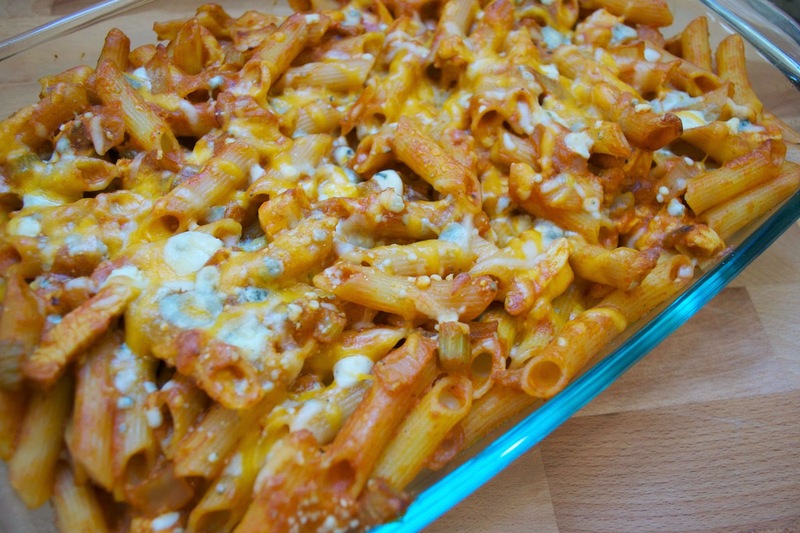 There are so many buffalo chicken pasta bakes out there. You know how I know? I've spent way to much time searching for the recipe I used when I originally made this. After copious amounts of recipe reading, I've determined that I must have read the original recipe wrong because I swear the recipe I used called for 3-4 cups of hot sauce (or it was a 3/4 misprint). I remember because as I was putting it in the pan, Nate started freaking out about the amount of hot sauce. We ended up using close to 3 cups of hot sauce and it was amazing and there is no evidence of it anywhere. I kid you not, I spent hours trying to find the recipe and after no luck, I decided to try the recipe that seems to be copied on no less than 20 different blogs. I upped the hot sauce to about 1.5 cups and while it was good, it wasn't even close to the first batch (IMO). In retrospect, I'm not really sure what drew me to this recipe originally but I swear it was amazing and I would love it if you could help me find it! Leave a comment if you've seen something like it or if you have an amazing buffalo chicken recipe. In the mean time, I'm going to try to wing it and recreate the dish... and this time write it down.